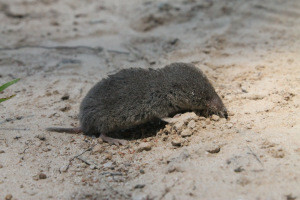 The shrew is a mouse-sized insectivore that is arguably the most voracious predator on the planet and the two most common varieties are the southern short-tailed shrew and the least shrew. Shrews have an extremely high metabolic rate. According to the Connecticut Department of Environmental Protection, this rapid conversion of food to energy requires that these animals consume up to their own body weight in food every single day. This is a short-tailed shrew I photographed and filmed for my program God’s Outdoors with Chester Moore. This variety actually has a toxic saliva.